A conveniently located & affordable venue choice for conferences, meetings & events. our experienced team provide an efficient, Professional Service at Affordable rates. Fairway Events Centre is the perfect Venue for your next conference. We are situated just 10 minutes from Auckland CBD, offer Plenty of Free parking and have Hosted conferences & Meetings from 20 to 200 guests. Our services are affordable, convenient and designed to suit every type of event, conference, or meeting requirement. All venue hire options include; event management, room set-up, AV equipment hire, tech support and WIFI. Simply add your menu choice from our range of conference options. Fairway Event Centre is just 10 mins from the Auckland CBD and 2 mins from the Northcote motorway off-ramp. We’re situated behind the North Shore Events Centre and have access to over 300 free parking spaces for the convenience of your guests. We can arrange reserved accessible parking spaces for specific guests as required. Our in-house chef has designed a range of scrumptious meal options. We can cater for any dietary requirements providing the perfect meal & refreshment package for you and your guests to enjoy. We have a fully licensed bar to offer “close of business” drinks. Technology and AV is crucial to the success and the smooth running of your meeting or conference. We can provide full AV equipment hire and onsite technical support, leaving you to focus on the other important aspects of your conference or meeting. The Fairway Events Centre has two, multifunctional, well appointed Function rooms available for conferences or for larger event you are able to hire the entire venue. The Fairway Room overlooks the Takapuna Golf Course with the option to access an outside deck area for refreshment breaks on sunny days. This is our largest room and can accommodate up to 300 standing or 200 seated guests. The Bunker, is perfect for smaller, more intimate meetings, conferences or could be a great break-out room. It can be set up in different formations and can accomodate up to 40 guests seated for a presentation. Our onsite chef ensures your food is Freshly prepared, Timely and delicious. 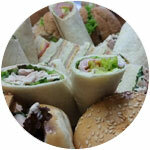 We can accommodate Your dietary requirements with our Menu Options. Get your team up and going with one of our nutritious and delicious options; either a fully cooked breakfast, or simply a continental selection, or we can cook up a breakfast BBQ to satisfy those hungry guests for an early start to the day. To quench that mid-morning tummy-rumbling, we prepare a lovely morning tea with a variety of nutritious options. We can even pop in some sweet treats such as blueberry muffins, chocolate brownie or biscuits. Includes Tea & Coffee. To feed your guests after a morning of productive meetings, we have a range of options from a selection of the good ole favourite sandwiches, wraps and cut fruit to a full buffet meal. We can even provide a full Spit-Roast to enjoy from our outdoor deck on a sunny day. 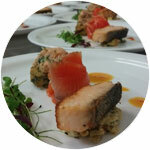 Talk to us about how we can cater for your dietary requirements with our onsite Chef. A little pick-me-up might be required during your conference afternoon break. Our delicious selection of savoury items might be just the thing to satisfy. A favourite choice are our yummy sausage rolls with mini pies or we can provide plenty of other options according to your requirements. Post conference dinner is a great chance for your guests to relax and network together in an informal environment. We can feed the hungry troops with options ranging from buffet style meals to formal dinners or a Spit-Roast, cooked onsite while your guests relax with a refreshing drink in hand, enjoying the view and company. A great way to finish the day after a conference, workshop or presentation. 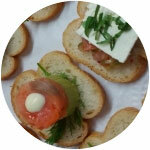 We serve a selection of platters and canapes to accompany your cocktails or drinks. Our onsite Chef can cater for any dietary requirements just talk to us about what you need to finish your day to perfection!